'The issue of migration will never be resolved by raising barriers, fomenting fear of others or denying assistance to those who legitimately aspire to a better life for themselves and their families,' he said. It comes as US President Donald Trump vows to fulfil his campaign pledge to build a wall along the border with Mexico. And on Friday threatened to close the border next week if Mexico did not stop immigrants reaching the United States. Francis was joined at the welcome ceremony by Moroccan King Mohammed VI, who has been working to spread a moderate form of Islam that promotes inter-religious dialogue and rejects any form of terrorism or violence in God's name. Morocco has become a key departure point for African migrants trying to reach Europe after crackdowns that closed or limited routes elsewhere. Italy's anti-immigrant interior minister has closed ports to rescue ships run by charity groups. 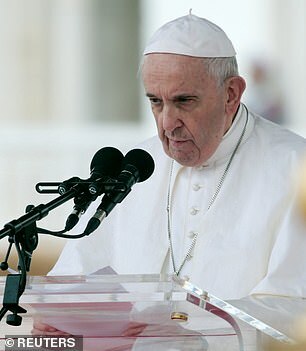 Francis, who has made defence of migrants and refugees a key part of his preaching, said he was concerned about their 'frequently grim fate' and receiving countries must acknowledge that migrants are forced to leave their homes because of poverty and political upheaval. From the airport to the city centre, Francis, 82, was driven in a white popemobile on a drizzly day as the 55-year-old king rode beside him standing in a separate vehicle, a vintage black 1969 open-top Mercedes 600 Pullman. At one point, a man rushed towards the king's car but was stopped and detained by guards as the motorcade continued along the street lined with bystanders. Police said he was a 17-year-old Moroccan who wanted to seek help from the king for his sick parents. After the arrival ceremony Francis and the king visited an institute the monarch founded in 2015 for the training of imams and male and female preachers of Islam. Morocco, which is nearly 100 percent Muslim, has marketed itself as an oasis of religious tolerance in a region torn by militancy. It has offered training to Muslim preachers from Africa and Europe on what it describes as moderate Islam. Francis, making the first papal visit to Morocco in 34 years, praised the monarch for providing 'sound training to combat all forms of extremism, which so often lead to violence and terrorism, and which, in any event, constitute an offence against religion and against God himself'.